• Exchange for a merchandise Certificate. • Return for refund of item/s received within 45 days of original ship date. 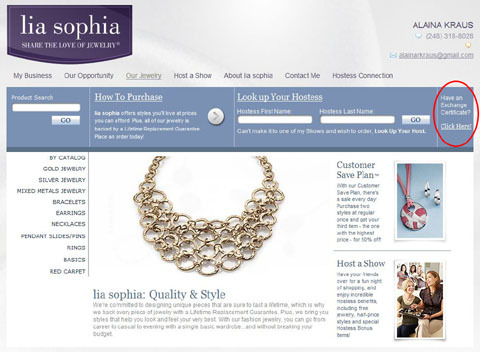 If you provide an email address your merchandise Certificate will be emailed to you allowing you to go online and order a replacement piece of jewelry even faster! Hostess Bonus Items can only be exchanged on a 1 to 1 basis with another item of an equal Hostess Bonus price. There is still a $5 handling fee once it has been over 120 days since purchase. If you would like to use an updated form for your exchange, 1067 – Exchange form nov 2010. Make sure to fill out the form wholly & completely in order to expedite the processing of your exchange. 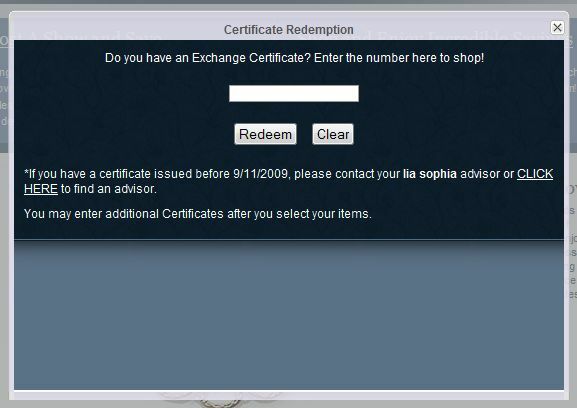 How do I redeem a lia sophia merchandise Certificate? Once you have received your merchandise certificate, go to the online catalog (either on an advisor’s site or through the lia sophia corporate homepage). On the right hand side about a third of the way down the page there is a box that says ‘Have an Exchange Certificate? Click here!’. I’ve circled it in the image below. A screen will pop up requesting that you enter in your certificate number. Once you have hit ‘redeem’ you’re ready to shop for your new piece. You can purchase items of greater value than the certificate. The certificate amount is subtracted from your total. Exchanges are shipped directly to your home.